Discussion Hi Everyone. Long Time! Been a lurker for the past year at least. Thought I should say hello with this post. Good to see some oldies are still around but also that there are some new members as well. Guess I will throw in a photo to keep this post relevant. Shot I took in Paris while cruising around at the Louvre. Hi Alex. Nice to see you post again. 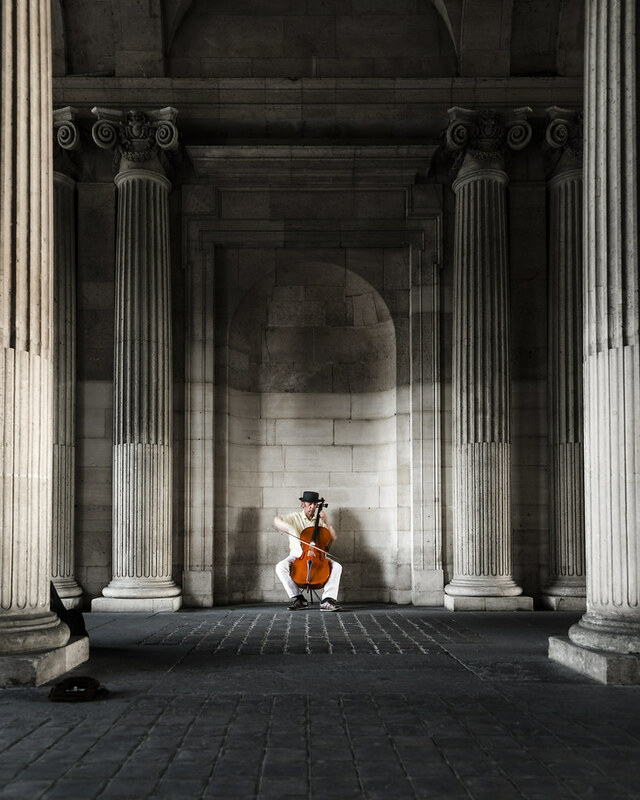 I really like the composition on this one, but even more, the fact that the only color other than beige/grey is the cello. And, oldies? Really? I think I resemble that remark! Really liking this one, Alex. Simple and elegant in presentation but dramatic in setting and starkness, instantly drawing the eye to the subject matter. Extremely well seen and captured, and flawless in processing! Great shot. It's interesting which associations a photo can give you. After admiring respectfully I noticed: He has no beggar gear on the ground! Why? Since this forum moved to the new posting mechanism, posting here became a pain. Oh hey! I was actually looking at the forums again because I am recommending it to some folks I'm working with. I found it to be a great resource back in the day. Nice to see some veterans here! Looks like a lot has changed since the aughts! Still a great resource here! Beautifully captured. I like the monotone feeling with just the cello being brown. Nice effect.